You are at:Home»Hair»Hair Styling»Hair Smoothening Procedure – Know it All! Principles Behind Hair Straightening Process- let’s go to the roots of the process and learn about the science behind Hair smoothening. This all goes to the basic structure and composition of hair, our hair is made up of a protein called keratin, which is fiber-like in nature. These fibers of keratin are kept in place with the help of a special type of bond, that is, disulphide bonds. These bonds are basically responsible for making your hair straight, curly or wavy. The hair erupts from a hair follicle which can be of several shapes. A straight hair comes out of a symmetrical hair follicle whereas a curly hair from a more asymmetrical one. When the cross-sections of these two hair types were observed under a microscope, circular cross-section was seen in case of straight hair and oval cross section in curly hair strand. However, now you can change the way your hair looks by using a number of techniques. The process begins with cleaning your hair and then drying it. Then a particular solution is applied to your hair which is then press dried to get that perfectly straight hair. The chemical that is applied onto your hair breaks the disulphide bonds of the hair protein and resets them in a straight fashion, which sets them permanently straight. The reconstruction of hair takes a little time like 2-3 days that is why you are advised not to wash your hair during those days so that the newly defined bonds are formed and stabilized. Smoothing is nothing but, an alignment technique Not a reconstruction of hair bonds, which stands true for Rebonding treatment. Smoothing just needs your middle and index finger to make your hair straight. Here, the hair swells up in some time and become smooth and full. 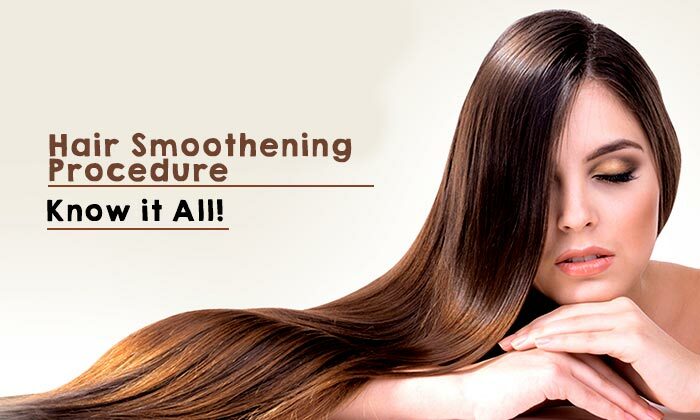 Hair smoothening is good for people who do not want artificial looking stick straight hair. People with naturally straight hair should opt for this as this is just to smoothen out the frizz and is not a deep process so has no everlasting effect. These days, girls love to have smooth hair with occasional waves and curls – this is apt for such kind of styling only. This is again a chemical treatment and provides shine plus soothes the frizzy hair but without damaging them. Its result can last up to 6 months and it is known by names like ‘keratin treatment’ or ‘Brazilian blow dry’ in the market. Hair smoothening process is best-suited for wavy and frizz-ridden hair, for extremely curly and thick hair this may not work and you can face disappointment. Hair smoothening treatment mainly aligns the hair and does not alter the hair structure, thus making it less permanent as well as less damaging. This process involves using a chemical, known as formaldehyde. Once hair has been completely treated with this chemical, they are dried and straightened using a flat iron. This procedure will leave your hair looking naturally straight and smooth. Now that we know what is the science behind it , let us check out how this is done? • Wash your hair with shampoo but do not use conditioner. • Dry them with blow dryer till all the moisture is removed. • Create four sections of hair. • Apply the Keratin solution on each section. • Use the comb to spread the keratin solution. • Leave the solution for 25-30 minutes. • After the solution is applied, comb your hair after every 10 minutes. • Rinse off with water and blow dry them again. • Apply the mask from the keratin kit on the entire head. • Leave it for 20 minutes and cover it with a cap. • Now rinse it with a lot of water. • Blow dry them and use flat iron 8-10 times to seal the solution. Hair smoothening is also a chemical process, it is like keratin process but differs in the way of the usage and chemical structure. So, Hair smoothening is a little complex, thus is always recommended to be done by hair experts only, who know how much chemical has to be used ,checking your hair type and density. The usage of chemicals is inevitable for any artificial straightening process. • Smoothening relies on fingers; no tools are used. Smoothening is like chemically settling sown the frizz for longer periods. • Hair smoothening does not involve a very strong chemical and does not change the structure of the hair, so it is considered a very mild procedure. It does not cause any permanent damage to the hair. • If you want to get a subtle-looking straighter hair, hair smoothening is your go-to option. • Formaldehyde can cause some side-effects like irritation in eyes or skin. • As it is a mild process, the effects do not last much longer. • Smoothening cons include not-so-very straight hair. The hair, although easier and smooth to handle do not stay that way for long and you can have curls and waves on even 4th day again. If you have extremely curly hair, spending on this procedure is not worth your money. Your hair can regain those curls within a few days only. As this is a chemical process , although a milder one still we need to use mild shampoos after this treatment. Using of Conditioners is always recommended, good quality ones which nourish your hair too. Occasional hair Masks will help you revive your hair health and reduce the effects of the chemicals used for the treatment. We must remember after going through Hair Smoothening treatment, not to use Oil massages for hair as this reduces the smooth effect and reduces the effectiveness of the treatment. You must use Hair serums to lock moisturiser in your hair. Rest, don’t be sad when you loose the effect as it is bound to happen! !